David Wadsley gained his M.Sc. at the University of Tasmania in 1941. In 1956 he was awarded a D.Sc. by the University of Tasmania for work which included his early approaches to the concept of crystallographic shear. After a period as physicist at the Munitions Supply Laboratories, joined CSIRO’s Division of Industrial Chemistry in 1943. His early work on manganese dioxide formed part of the late Allan Walkley’s programme of war-time research on dry cells, but Wadsley soon developed a line of research which was to become characteristically his own during the next twenty years. 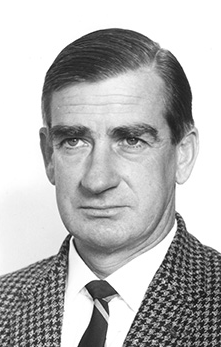 Dr. Wadsley was a brilliant scientist of first-class international standing. He gave many invited lectures overseas and was the recipient of a large number of requests from scientists who wished to work in his research group. He was notable for the independence and adventurousness of his scientific thinking, but he enjoyed nothing more than the reasoned questioning and probing of his ideas by other scientists and collaborators. In 1967 he became Assistant Chief of the Division of Mineral Chemistry, but his administrative duties seemed only to act as a spur to his prolific publication rate. David Wadsley died at the peak of his career. On the 6th January 1969 he suffered a severe coronary occlusion while chairing the opening session of the International Conference on the Chemistry and Physics of the Earth’s Mantle in Canberra. He died later that day in hospital.